Dec 19, 2014: The European Space Agency’s orbiting Rosetta spacecraft is expected to come within four miles (six kilometers) of the surface of comet 67P/Churyumov–Gerasimenko in February of next year. The flyby will be the closest the comet explorer will come during its prime mission. 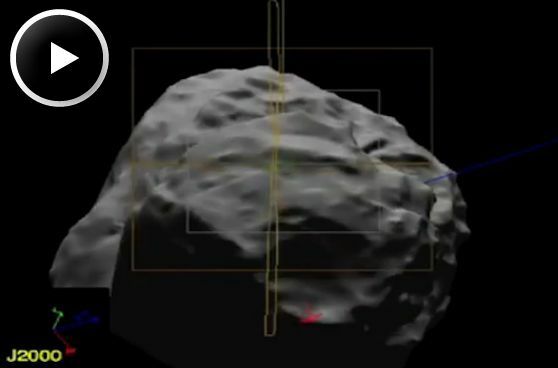 This animation shows Comet 67P/Churyumov-Gerasimenko, with overlay boxes indicating the fields of view of three cameras on the European Space Agency's Rosetta spacecraft: the wide angle camera of OSIRIS, the narrow angle camera of OSIRIS and the spacecraft's Navigation Camera. The low flyby will be an opportunity for Rosetta to obtain imagery with a resolution of a few inches (tens of centimeters) per pixel. The imagery is expected to provide information on the comet’s porosity and albedo (its reflectance). The flyby will also allow the study of the processes by which cometary dust is accelerated by the cometary gas emission. “Rosetta is providing us with a grandstand seat of the comet throughout the next year. This flyby will put us track side -- it’s going to be that close,” said Taylor. The Rosetta orbiter deployed its Philae lander to one spot on the comet's surface in November. Philae obtained the first images taken from a comet's surface and will provide analysis of the comet's possible primordial composition. Comets are time capsules containing primitive material left over from the epoch when our sun and its planets formed. Rosetta will be the first spacecraft to witness at close proximity how a comet changes as it is subjected to the increasing intensity of the sun's radiation. Observations will help scientists learn more about the origin and evolution of our solar system and the role comets may have played in seeding Earth with water, and perhaps even life.